Chris Rutt and Charles Underwood developed a ready mix pancake recipe called Aunt Jemima in 1889. 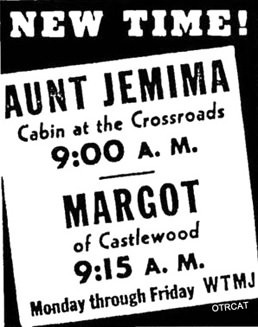 In 1890 Nancy Green was hired as the spokeswoman to portray Aunt Jemima for promotional events later the role was filled by Anna Robinson at the 1933 Chicago World's Fair until 1951, Aylene Lewis at the opening of Disneyland. 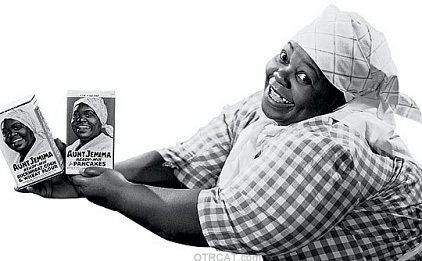 The image is Aunt Jemima is controversial due to the disparaging racial stereotype it promotes. 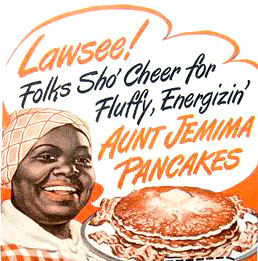 Objections to the depiction of Aunt Jemima and other black advertising date back to the 1920s. To counter this, the image of Aunt Jemima has changed drastically throughout its 118-year history. Throughout most of the old time radio series, Caucasian actress Tess Gardella portrayed Aunt Jemima's radio voice..Harriette Widmer from Amos and Andy also portrayed the famous pancake cook and her performances are included in this 1943 version of the show in this collection. The Aunt Jemima old time radio show includes the Jemima Chorus singing melodious tunes with interjections of announcer Marvin Miller and Aunt Jemima explaining why her pancakes are special and easy to make. She also offers a "Happy Thought for the Day" with traditional wisdom such as "You can't buy happiness, it has to be earned." But you can buy pancakes, and they make you happy. Each show is approximately five minutes long and includes some surprisingly non-breakfast related but excellent musical numbers. Be forewarned, the Aunt Jemima old time radio show causes strong pancake cravings and would be a fun addition to breakfast. This collection is part of the larger Minstrel Show Collection. For more interesting reading, See also: article on the history of Minstrel Shows and Old Time Radio. This collection is in the extensive Hummert Radio Factory Collection. Called the parents of soap opera, Anne and Frank Hummert also created Betty and Bob, Front Page Farrell, Mr. Keen Tracer of Lost Persons, Ma Perkins, Just Plain Bill, Mary Noble Backstage Wife, Young Widder Brown, Mr. Chameleon, Stella Dallas, Manhattan Merry Go Round, Lora Lawton, The American Melody Hour, Hearthstone of the Death Squad, Lorenzo Jones, Nona From Nowhere, Our Gal Sunday, Inspector Thorne, Romance of Helen Trent, and more. Be the first to comment on "Aunt Jemima"